Sometimes Dell teams and customers need data on demand, wherever they are. Here's what that can look like. Please note, none of the dashboard data is real. [Alex] relies on her wealth of experience and knowledge to provide well thought through design solutions. When she does not know something, she learns it; quickly. She does not sit idle and is always learning which makes her a great advocate for a better user experience. If you have a complex UX/UI issue that needs to be solved Alex would be a great choice. 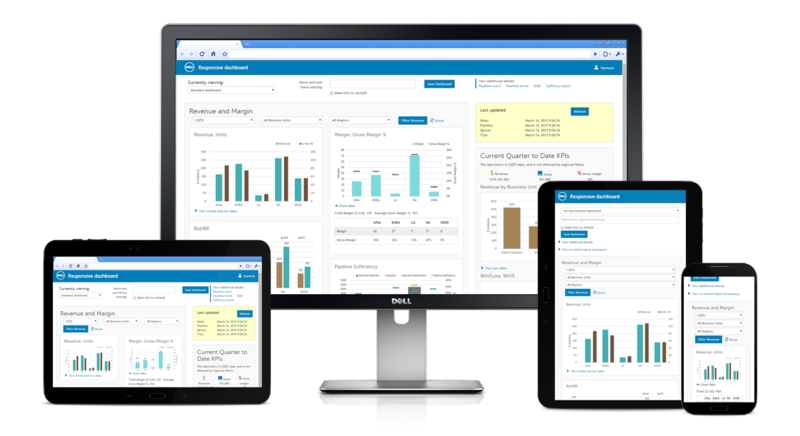 This was my first project for the IT Innovation Team: a mobile dashboard for the ESG (Enterprise Solutions Group). The goal was to provide a prototype that demonstrated options and best practices; could be used in further design and development; and could help define requirements for data visualization vendors, should Dell decide not to develop in-house. This was a "live wire" prototype done in Bootstrap, using Dell brand styles. This approach allowed us to demonstrate concepts, innovations, and interactions quickly and test them, before diving into more detailed visual styling. I no longer have the prototype, but I do have screen shots and one photoshopped image (above) created from the screen shots. 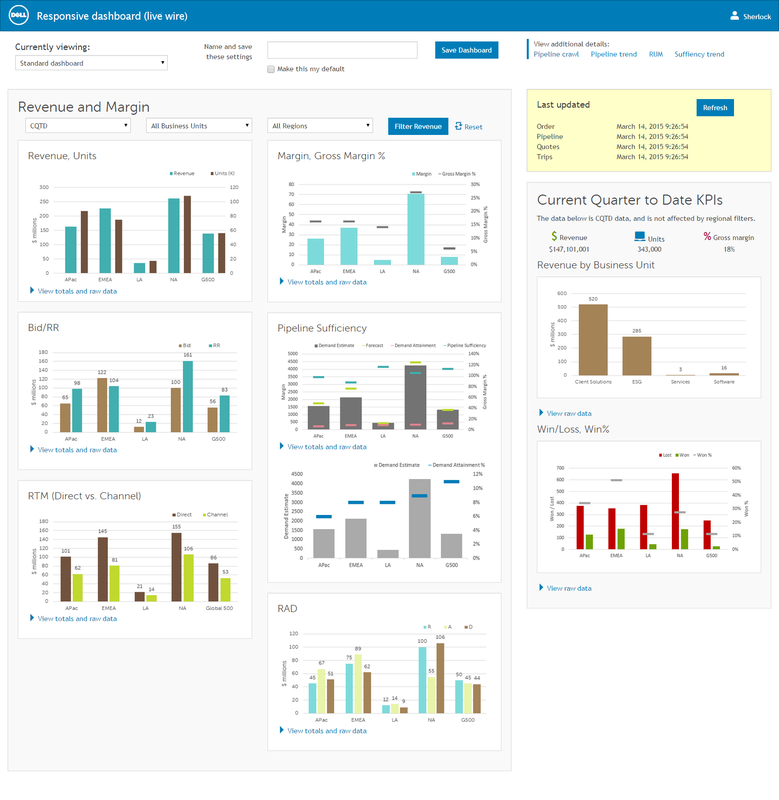 The charts are not the final version, but they follow my self-developed dashboard and data viz accessibility guidelines, later adopted by Dell Brand for all Dell data visualization. Proximity and borders/background colors group related charts to reduce cognitive load. Apart from links and various calls to action, the only non-gray colors are in the charts. Keeping colors in the charts reduces distraction. Each chart has a link to an on-demand table version of the content, for users who prefer tables to visual content. Viewers can filter data by time frame, region, and business unit. They can also save filter settings and choose to make a specific filter setting their default. There were multiple data sources, and the time stamp recency reflected that. Typically they were in sync, but not always. "Reset" allows a quick return to your default state. Grouping is preserved in mobile view. Details such as timestamp are hidden behind expand/collapse links. No Feature Left Behind: If you can see it on a desktop, you should be able to access it on your phone. Mobile dashboards are useless without all the data and features, though interactions may change. Lots of scrolling—but then, there's lots of data. This is cropped; click for the entire vertical scroll. Click on image to see the full vertical scroll in a new tab.